Le Chili et Les Provinces qui Composent Celles de Rio de la Plata avec les Terres Magellanique. 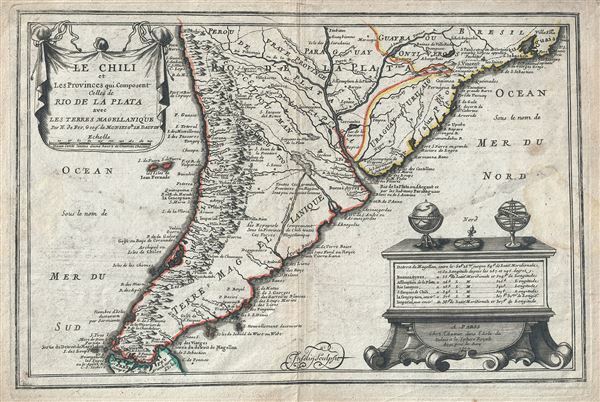 This is a beautiful 1702 map of southern South America by Nicholas De Fer. It covers from Rio de Janeiro south to the Strait of Magellan and Tierra del Fuego, and includes the modern day nations of Paraguay, Chile, Uruguay and Argentina, with the southern portions of Brazil and Bolivia. The map renders the entire region in extraordinary detail offering both topographical and political information with the Andes Mountains beautifully rendered in profile. This map, like most early maps of the area, offers a fairly accurate mapping of both the east and west coasts with exceptional detail, while the interiors are mapped speculatively. The Strait of Magellan is mapped in detail. Discovered in 1520 by the Portuguese sailor Ferdinand Magellan, the first explores circumnavigate the globe, this natural channel linking the Atlantic and Pacific Oceans though a challenging route to navigate (given the unpredictable winds and currents), is the fastest connection between the two oceans. This map was engraved by Charles Inselin and created by Nicholas De Fer for his 1701 Atlas. Very good. Minor wear and toning along original centerfold. Original platemark visible. Some foxing near right border.